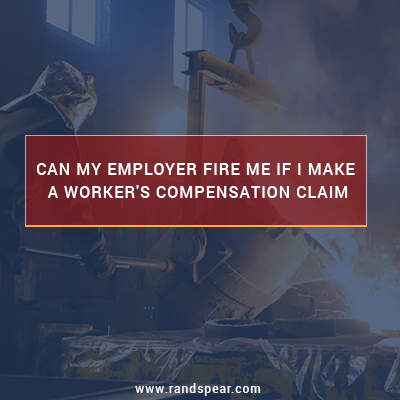 Pennsylvania workers’ compensation attorney, Rand Spear, knows that workers’ compensation claims can be challenging, yet most people who are injured at work do not seek the advice of an attorney. Instead they believe that their employer and workers’ compensation insurance will take care of them. However, there are situations in which that doesn’t happen. One such situation is when an employee is fired after reporting a work injury. In Pennsylvania, the answer to that question is no. An employer cannot fire an employee for reporting a workplace injury or illness or for making a workers’ compensation claim. However, if an employee is terminated subsequent to making a claim, it’s often difficult to prove why he or she was fired or laid off, and that it was related to the workers’ compensation claim. As an employee who has been let go, you can inquire as to the reasons, but it’s hard to know if you are getting honest answers. Your employer may cite poor performance, policy violations, or any number of other terminable offenses. It is very unlikely that your employer will tell you that your firing is at all related to your workers’ compensation filing. What Can Be Done If an Employee is Terminated After Filing a Workers’ Compensation Claim? If you reported your injury properly, filed a claim, and then got fired, you may have grounds for a workers’ compensation retaliation lawsuit against your employer – if it is found that you were wrongfully terminated. The only time that an employer is able to terminate an employee after they file a claim is if the employee willfully violated workplace rules and that violation caused the injury. Unfortunately, sometimes employers will claim this is the case, even when it isn’t true. You can see that these cases can become quite complicated, so it is important that you have a knowledgeable workers’ compensation attorney to help you with your lawsuit. You and your attorney will have to prove that there is a causal link between your workers’ compensation claim and your termination, that you have not violated any workplace rules or policies, and that you were not let go for any other legitimate reason. If you have been fired after filing a workers’ compensation claim, you need a workers’ compensation attorney who will fight for you. Contact Philadelphia lawyer, Rand Spear, at 877-GET-RAND to get the help you need.